3 Story Indoor Playground. Arcade. Restaurant. 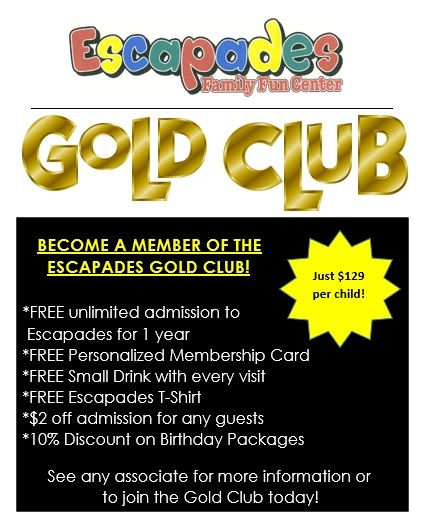 East Central Indiana's Premier Indoor Family Fun Center. Standing a massive three stories tall, once you enter the Escapades maze, it's a chance to escape into a world that's all your own! From twisting tubes to slippery slides, monkey bars, a ball pit, rope bridge, and so much more, our maze has become a staple attraction in East Central Indiana. It's a healthy dose of fun, exercise, and best of all - there's no height, age, or weight limit. What are you waiting for? The yellow slide is ready for you! Our indoor arcade is stocked full with over twenty different games, including classics like basketball, air hockey, and multi lane ski ball, plus new interactive video games, racers, coin pushers, and that's just the beginning! We are also proud to feature a TouchTunes digital jukebox so you can be the house DJ for the day! 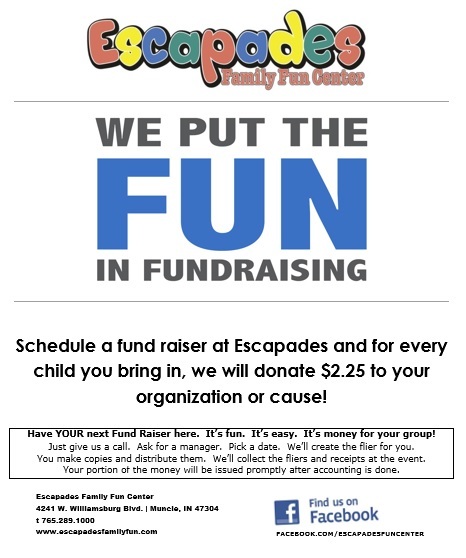 Escapades is also home to a brand new toddler area! This brand new attraction is only for kids age 3 and under. We custom designed this area especially for your little ones in mind, with textured climbing areas, slides, interactive displays, and much more! 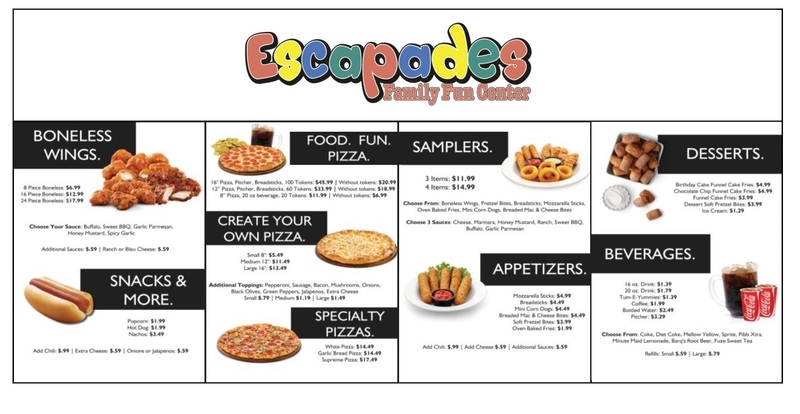 Once you work up an appetite, head over to the Escapades Cafe'. Grab a pizza and some of our famous breadsticks, or load up on a sampler with boneless wings, mozzarella sticks, and pretzel bites. Got a sweet tooth? Check out our chocolate chip funnel cake fries! And don't forget to cool off with an iced cold Coke...our made-to-order menu has something for everyone! 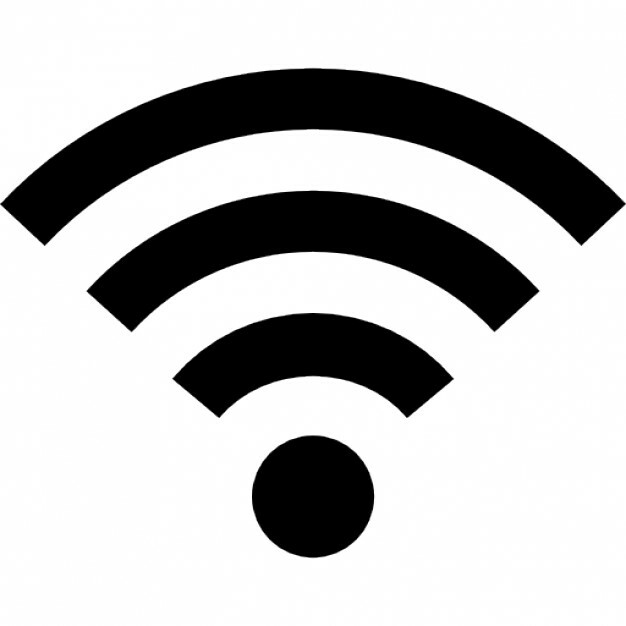 Escapades also offers a newly remodeled Parent Lounge for adults with complimentary in-house magazines, a quiet seating area, and complimentary wi-fi, so you can surf the web or just get some work done while the kiddos play! We've also added brand new shiatsu massage chairs to our parent lounge for those who are needing to get in some extra relaxation time! 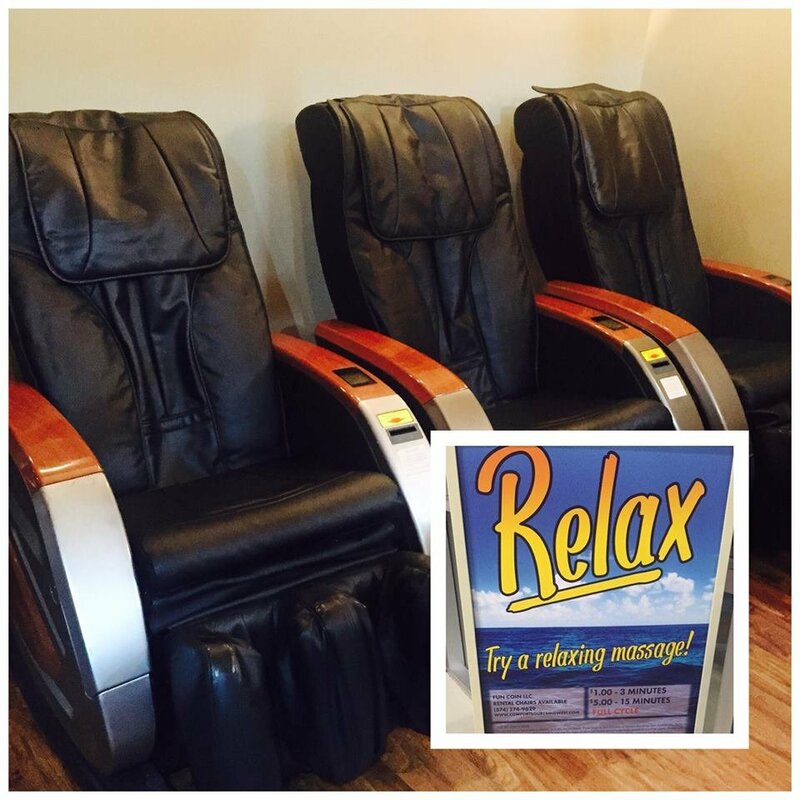 Our state of the art shiatsu massage chairs accept cash or card and offer massage times ranging from six minutes up to an hour.